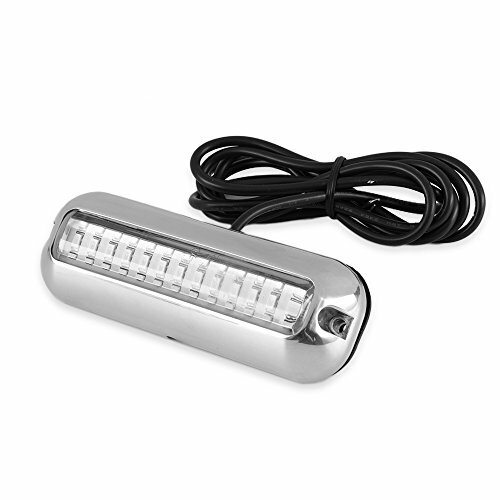 ➤ BRIGHT LIGHTS: Equipped with 39 pcs LED as well as 95 LM effective lumen, it's much brighter than many other transom lights. These LED lights provides a simple and effective boat safety lighting with low power consumption. ➤ DURABLE MATERIAL: Made of high quality SS316 stainless steel housing construction, it is light weight and long lasting life. ➤ IP68 WATERPROOF: No need to worry about the pouring rain or strong wind any more, the Ingress Protection Rating is up to IP68 waterproof. It can also work well under the water line. ➤ EASY TO INSTALL: Come with mounting screws and polished stainless steel housing with rubber gaskets, great for quick and easy mounting installation. ➤ WIDE APPLICATION: Great boat accessories gifts. Perfect replacement lights for the back of the pontoon boat. Can be use as stern light or running light, which can improve the safety when boating, especially at night. Ideal for most pontoon, yacht, skeeter, touring car, fishing boat, speed boat and other boats.